Two popular restaurant chains will soon open franchises in Palm Coast: International House of Pancakes will open near the Island Walk Starbucks on Palm Coast Parkway. And Chipotle will open next to Panera Bread on State Road 100. Chipotle Mexican Grill had been eyeing the site immediately adjacent to Panera since last fall. The city issued the franchise’s contractor, Buffalo Construction, a commercial construction permit on July 25, for a $475,000 shell building on the 0.87-acre site, and an additional unit whose tenant has yet to be determined. IHOP, as it is known colloquially and in its marketing and signage iconography, filed an application for a commercial permit, an early step toward building a $125,600 restaurant in the heart of the older part of town. The nearest IHOPs to Palm Coast these days are in Ormond Beach and St. Augustine. But the city does not know either restaurant’s timeline for actual construction and completion, a city spokesperson said this morning. Meanwhile work is progressing on Palm Coast’s two Starbucks locations: at Island Walk, the work is 95 percent completed, according to a city construction update released last week, with a utility inspection taking place on July 26. That Starbucks is a replacement for its older version almost at the same location. A new Starbucks is going up at the Shoppes of Palm Coast, the new development where Aldi, the grocery store, opened earlier this week. That Starbucks is about a third of the way through. Both Chipotle and IHOP are firmly established brands in the restaurant-chain business, though both have had their struggles of late. Chipotle weathered a severe blow to its brand in 2015 after series of viral outbreaks were linked to its restaurants in the summer and fall of 2015. Chipotle stock lost half its value and has yet to recover, though last week it posted solid second-quarter earnings, with total revenue rising 17 percent over the previous year’s quarter even as the chain continued to build new restaurants. IHOP is owned by DineEquity, which also owns the Applebee’s restaurant chain. The company’s fortunes have followed the same trajectory as Chipotle’s, with DineEquity stock tumbling from a high of $110 per share in 2015 to $40 today. There are close to 1,700 IHOP restaurants. 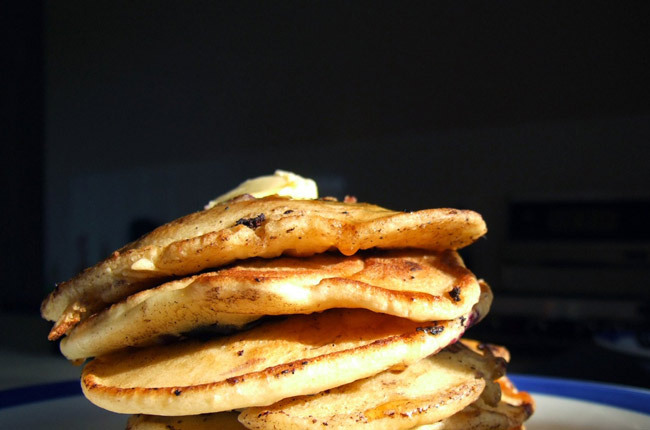 IHOP restaurants now offer all-you-can-eat pancakes, but the deal “may not be as sweet as it seems,” Business Insider’s Hollis Johnson and Kate Taylor reported, after surviving the experience. Maybe Sea Ray should get into the food business. Chipotle is good news to me; IHOP, on the other hand, not so much. Can someone open a real restaurant please?? How about another Wendy’s or McDonalds? We only have four of each. No way I would eat at Chipotle! That’s some nasty food. Food looks like diarrhea. Great, just what Palm Coast needs – more low wage jobs. That’s great another 2 big chain restaurants located off of I-95 so more “unsavory” characters can congregate in the parking lots at all hours of the day and night. You would think we have had enough with the all in one gas stations like Raceway which is ah right across the street. Would be nice if PC brought in some high class restaurants instead of all chain restaurants that are like a little above fast food places. Yes Palm Coast needs a few Good places to eat . When are they coming ? Enough with these low class restaurants., what’s next Palm Coast planning council a Popeye chicken, Waffle House or a Taco Bell. Give this city some decent food establishments. Enough with the grease. .
How about a manufacturing plant,tech company,etc etc 1,000 good paying jobs with benefits, and pensions…ENOUGH WITH GARBAGE EMPLOYMENT!! I’m with you Jonn! I’m a retired mechanical engineer and would like to see manufacturing and tech companies. I might go back to work. Right now I make more money retired then I would working at one of those restaurants, gas station or convenience store. We can’t force businesses to open here. They come based on demographic and how their company thinks they can do in our town. All these complaints about more high class choices act as if the city is selecting the companies that come here. Instead of all these places to eat ,maybe someone could build a nice miniature golf course in this city so many children and adults could have some nice outside enjoyment ,instead of just catering to the retired people of Palm Coast,,,let us build some things for our youth also! How about more medical and therapy business that focus around the elderly and disabled and a senior center and facility like the ocean center. This food should not be consumed ,none of this food is good for our children, and as adults we are expected by our government to have common sense not to eat this bad food, yet they are allowed to put it all over our city ,in our face to tempt us, please people ,better food equals a better community,it all starts with what we put in our bodies, less suicide , leas domestic abuse and a more pleasant neighborhood starts with good food!! Enough of all this fast food…..How about a Mimi’s Cafe – great place, good food, or El Pollo Loco…heart healthy fire grilled and nice prices….with patio area for outside eating…..Or a REAL MEXICAN RESTRAUANT….NOT THIS Tex Mex Conftinental garbage that all the place here have tried to pass off as Mexican food……Look a little deeper into other places….better for us, nicer to dine at, and healthy good tasting food…..In my heart know that this will never happen here….but had to try…..
How about everyone just stay at home , stop your whining, go to the local grocery store buy some food , go home and cook it and set down and enjoy your own cooking. You’re right. Teenagers don’t need jobs. We also need the city limiting where we eat by where they say it’s healthy or not. I’m sure nobody here ever had a first job, a first management position, or the common sense to realize that EVERY restaurant offers healthy options. We all have a choice as to when, what and how much we eat. Stop complaining and maybe involve the police if there are trespassers, form community watch groups, or start your own franchise.